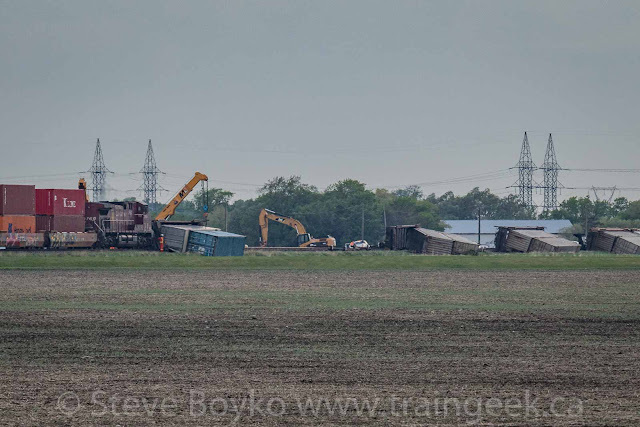 Late in the afternoon of May 29, 2018, around 4:45 PM I think, an eastbound Canadian Pacific Railway train derailed between Rosser and Winnipeg, Manitoba. 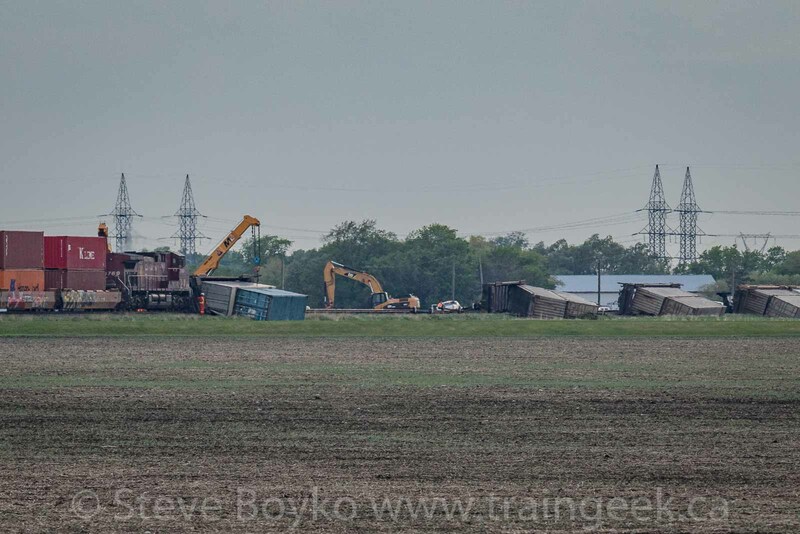 About 13 double-stacked container platforms were blown over by strong winds. 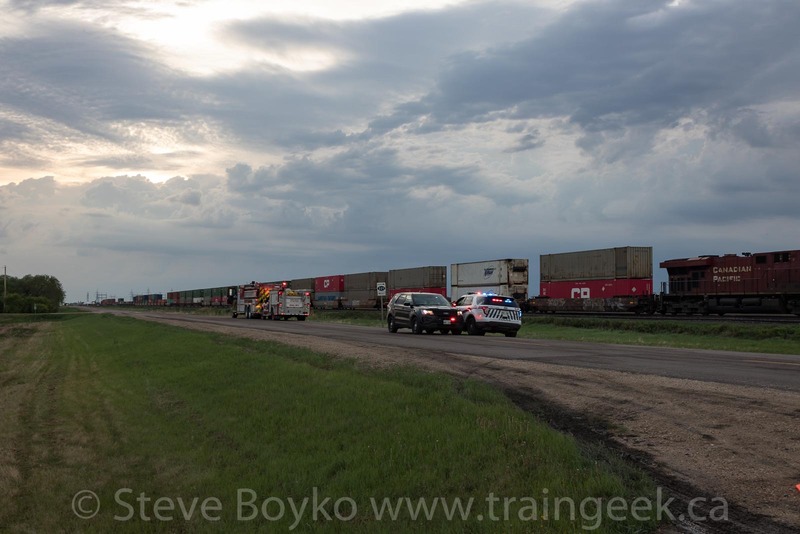 Local railfan Felix Lesiuk passed by the scene before the highway was closed and took some photos. He graciously gave permission for me to post a couple. There are more on the Winnipeg Model Railroad blog. CP derailment scene. Photo by Felix Lesiuk. Truck and kingpin - a rare sight. Photo by Felix Lesiuk. 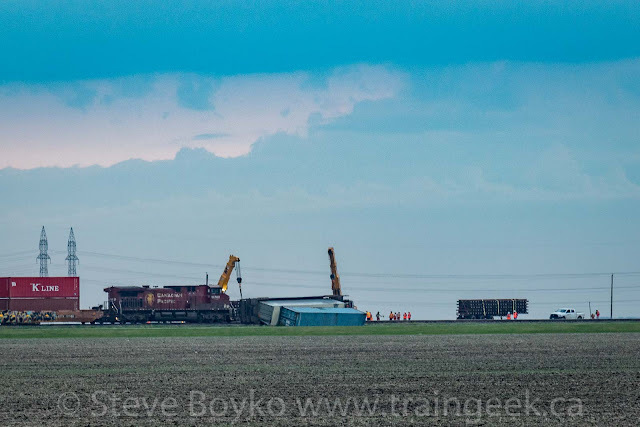 I was initially unaware of the derailment. After supper, I went out for a bike ride. When I returned home, I checked my email and a friend in the area had sent me a message about the derailment (thanks Sheldon!). It was 8 PM at this point. I grabbed my camera bag and rushed up north toward Rosser. I arrived "on scene" at 8:40 PM. 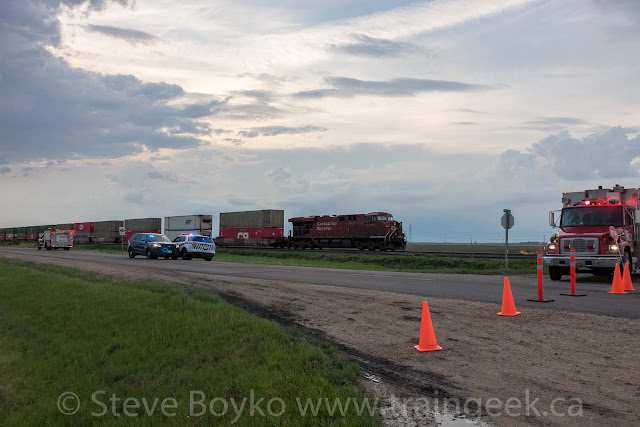 Highway 221, which parallels the CP Carberry subdivision, was blocked off just over 5 km west of the Perimeter Highway (road 3E), where the head end of the train was. 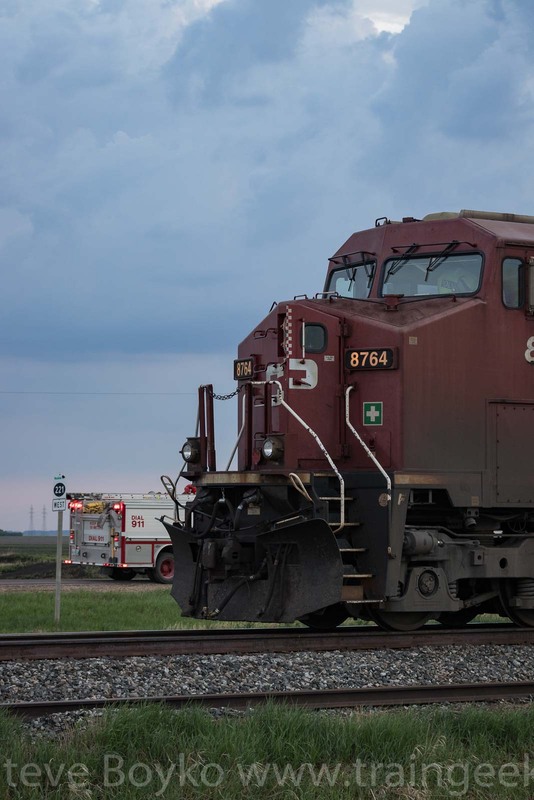 The marked location "2.77 km" is where the train was, on the west side of Winnipeg. The 2.77 km is the approximate length of the train. 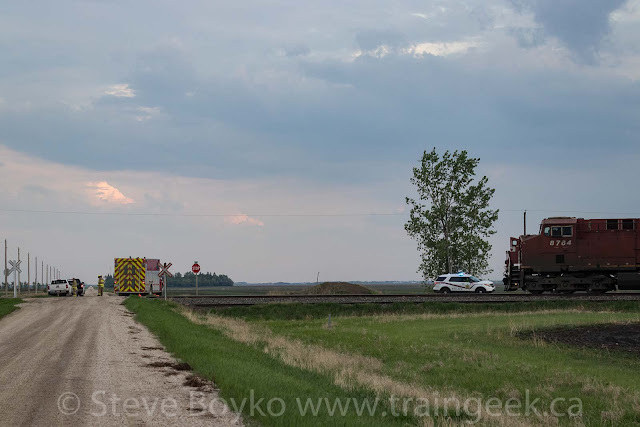 The local fire department was manning a blockade on the east end, with CP Police right behind them. I parked down road 3E then walked up to the barricade to take the photo above. The firefighters eyed my camera and cautioned me to be safe. I assured them I would stay on the public roads outside their perimeter. The train was headed by CP 8764 (which I last saw in Spillimacheen, BC), with a mid train DPU (CP 9769) and a tail end DPU. 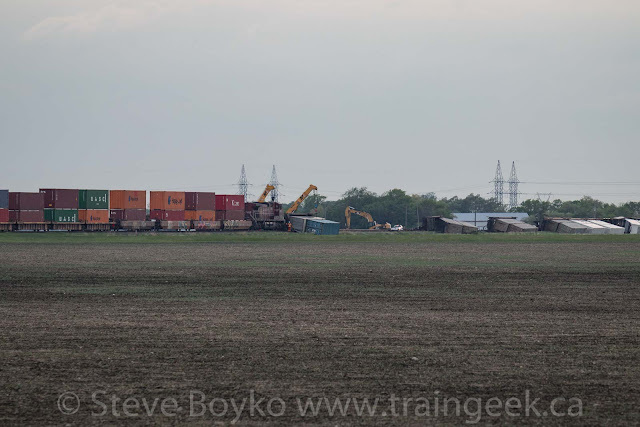 There were about 8 or 9 autoracks in front of the tail end DPU and all were still upright, along with a couple of doublestacks. I was glad to hear that nobody was injured, and there seemed to be no concern about hazardous materials. The road was blocked off so the cleanup crews could work without interference from passing cars. There were a fair number of people gawking from their cars but I don't think anyone was walking around like I was. I talked to two gentlemen from a nearby farming colony who were pretty curious about the situation. 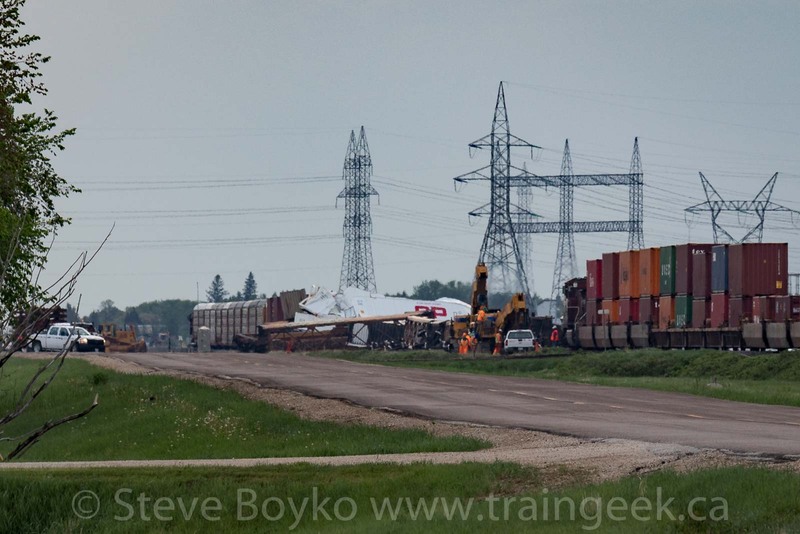 It looks like about 13-15 platforms blew over right behind the mid train locomotive. Lots of equipment was on site and cranes were in operation, with more arriving while I was there. 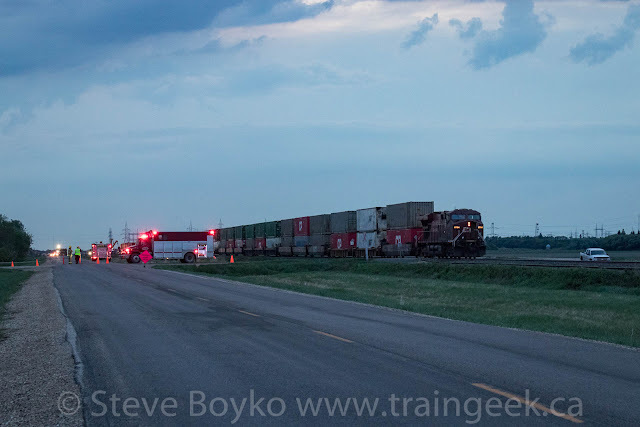 I brought out the long lens to get some shots from the grid roads around the train. I walked north up road 3E to get some decent angles. The 70-200mm lens was earning its keep. I tried the road parallel to the highway, a mile north. You can see track panels on a truck trailer in the photo below, ready to install to patch up damaged track. 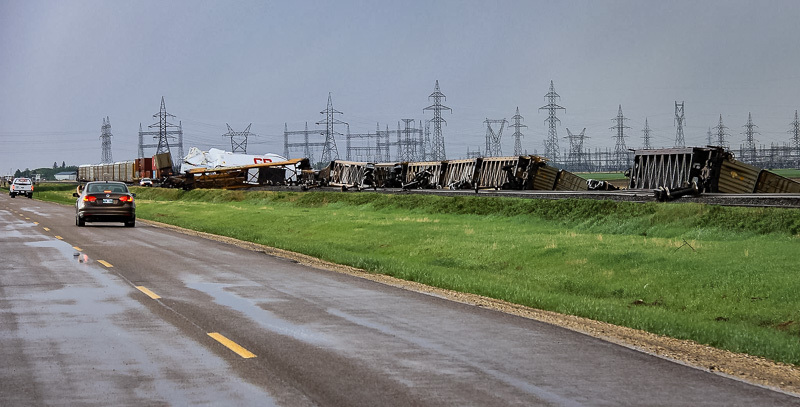 Note the track panels on the truck trailer on the right. 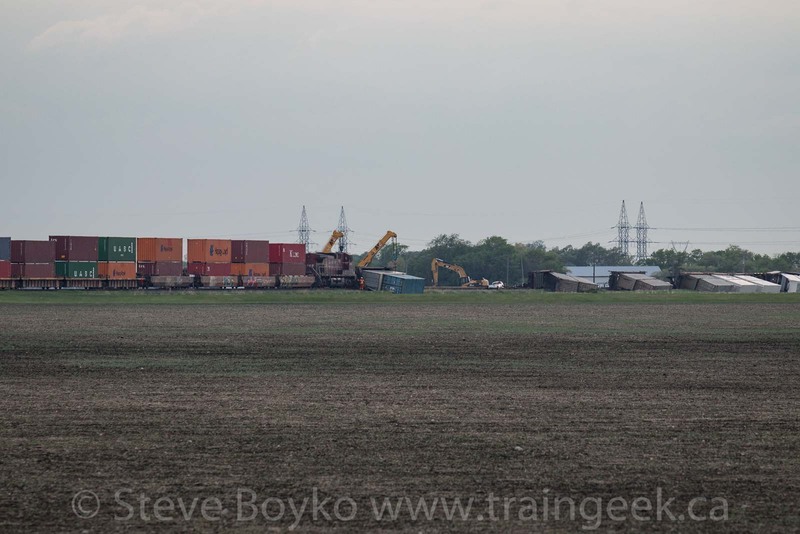 I took a video of the train, using my long lens and my monopod for a little stability. It's still a bit jerky but a lot better than it would have been hand-held. It was getting fairly dark by this point - about 9:15 PM. I tried the west end of the blockade, but it was a long way from the train and there really was nothing to see from there. I decided that I had all the shots I could get, so I wrapped up with a few more from the head end and prepared to leave. 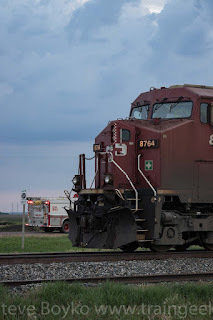 As I was getting in my car, I heard CP 8764's horn blow. I watched as the front end of the train slooooowly crept forward, dragging the front end of the train behind it. This was 9:40 PM. I headed for home after that. Everyone on site was very professional and were working hard to clear the wreck and restore service. It's unfortunate that this happened just before the CP engineers and conductors went on strike. Fortunately they quickly reached a tentative agreement and they are going back to work. 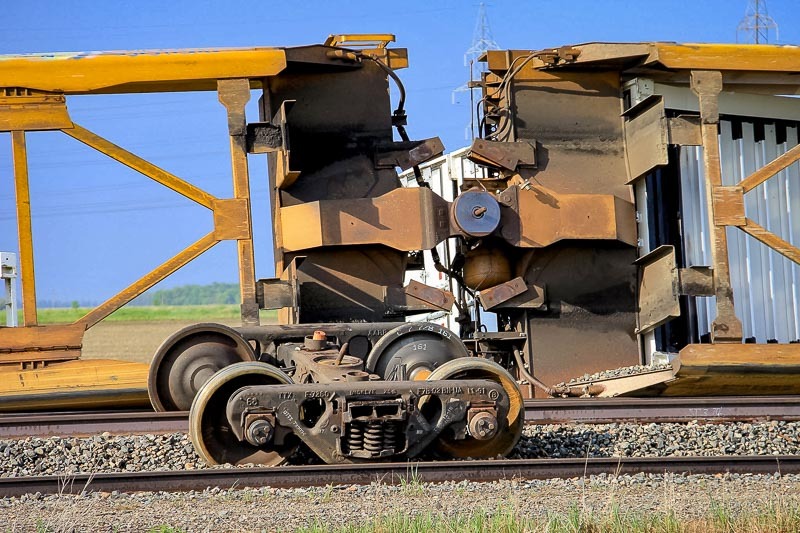 Seeing as I've never seen a company like RJ Corman around here, who comes out to clean up derailments like this? 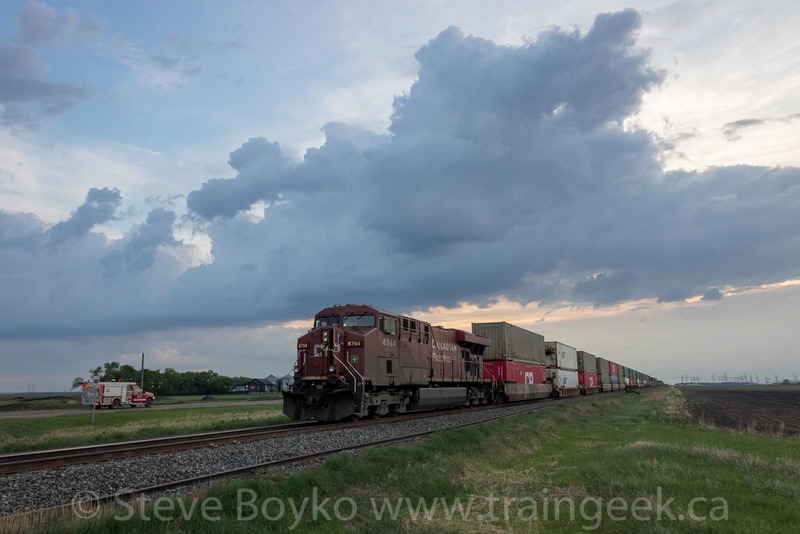 Is it a local company/companies or do CN and CP lease or own their own equipment and crew it themselves? If it was DiY, I'd expect purpose built rerailing cranes. Hi Rick, I *think* there are CN and CP specialists but they contract out most of the equipment and crews. I don't know for certain.